VANCOUVER, B.C. 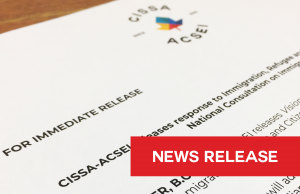 – CISSA-ACSEI releases Vision 2020: Immigration Levels Plan 2018 – 2020, a response to Immigration, Refugees and Citizenship Minister Hussen’s national consultation on immigration. The CISSA-ACSEI Vision 2020: Immigration Levels Plan 2018 – 2020 outlines immigration levels of fifty thousand (50,000) annually over the next three years.The steady increase of fifty thousand (50,000) newcomers annually will respond to and address Canada’s aging population, decline in population in certain regions, decline in birth rate, and increased labour market shortages. The multi-year plan will allow for long-term planning for immigration and refugee policy, newcomer settlement and integration services, and ultimately, improved outcomes for newcomer integration. Increase humanitarian class refugees and protected persons with an annual baseline of 20,000 government assisted refugees and privately sponsored refugees. CISSA-ACSEI welcomes the opportunity to provide input and is looking forward to a pan-Canadian discussion on the future direction of immigration in Canada. CISSA-ACSEI is a pan-Canadian association formed to represent the immigrant settlement sector in Canada. We have the knowledge and the expertise to influence immigration policy and enhance settlement and integration programs.